With the illustrated example above we show the practical elements that comprise the key steps of computational imaging. These steps can be generalized as computational illumination/optical encoding, image capture and image processing/decoding. Using a monochrome camera with a CCS full-color ring light, which has 3-channel control of red, green, and blue output, the user can generate full resolution RGB color images at practical data rates. By grabbing a sequence of 3 monochrome images correlated to red, green, and blue strobes, a full color composite image at the full monochrome resolution can be created by aligning the images and using the red, green, and blue values for each pixel to create the color pixel. In this example, the resulting composite color images are much sharper than that of a single image capture with a Bayer or mosaic color camera. The images are similar to those from 3-CCD cameras without the expense, special prism or lens limitations, and at much higher resolutions than that of available 3-CCD cameras. The advantage of this method is the ability to have the best of both worlds; complete color information at the full pixel resolution of the imager. 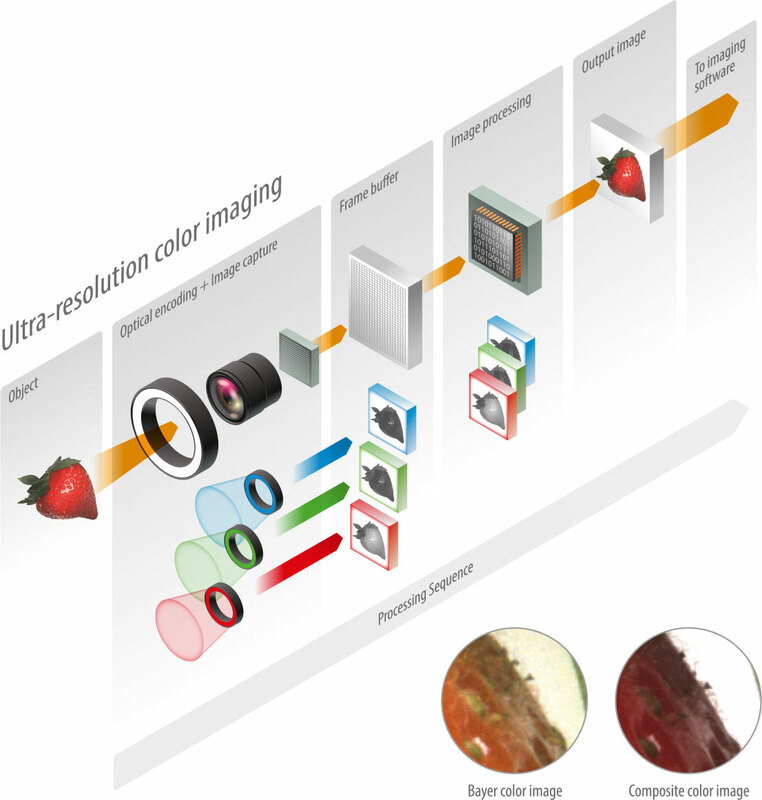 Due to the spatial effects of interpolation, Bayer color imagers capture the color information, but lose spatial resolution across several pixels.